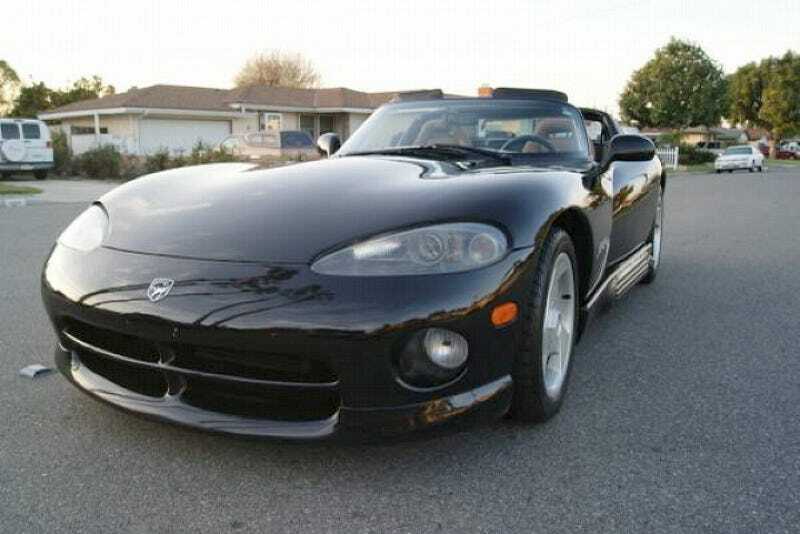 Could This 1995 Dodge Viper RT/10 Be Worth $25,000? The average selling price of a new car in the U.S. is now over thirty one thousand dollars. That means today's Nice Price or Crack Pipe Viper is below average - price wise - but will that make it an above-average deal? You know, one of the complaints - perhaps the only one - leveled at Acura's first-generation NSX was that it was so good, so well balanced and easy to drive, that it diminished the act of mastering a super car to that of learning how to drive an Accord. That has never been said of the Dodge Viper. In fact, the original '92-'95 RT/10 was so uncompromising and unforgiving of those of limited talent and luck, that it rightfully should have come with a government warning sticker, like on a pack of cigarettes. The Viper came about thanks to Lamborghini, which Chrysler just so happened to own from '87 through '94. The Italian company engineered the Viper's centerpiece, an all-aluminum 8-litre edition of what would become Chrysler's torque of the town V10 truck motor. They also talked using their hands and said mama mia a lot, or so I have heard. Despite being made from the same stuff as the cans of beer you had for breakfast, the pushrod V10 still tipped the scales at over 700 pounds. Dodge tried to balance that by making up the rest of the car out of a bunch of square section tubes and a body formed from RTM plastic. They also left off a whole bunch of those electronic nannies that might have helped control the Viper's 400 horsepower, but added unnecessary ounces to the car's 3,300-lb curb weight. That means that today's 1995 Viper RT/10 eschews modern features like ABS, airbags, and traction control. It also says to hell with things like outside door handles and roll-up windows because those are luxuries only required of dilettantes or the easily confused. Instead, getting into one of these 1st generation vipers requires a reach-around, popping the door from the inside. And, if you are foolish enough to drive this car in the rain - with its 465 lb-ft of torque and tires wide enough to make two cat pancakes at a time - there are a soft top and side curtains to keep you reasonably dry while you contemplate the car's wet traction capabilities in action. There's also a Tremec T56 6-speed, although these cars really only need a couple of gears, owing to the torque, and maybe reverse, if backing up is your thing. This one nicely comes with the factory wheels, so factory in fact that they haven't even ever been chrome plated. The rest of the car is black over biscuit, a color combination you don't see every day, and has rolled over the course of its life a mere 34,450 miles. By the way, if those were all city miles, that would equate to about 2,870 gallons of gas. Shee-it! Not having a ton of added features means there's less to go wrong, and this Viper seems to have a lot that's right going on about it. The seller claims the car to have been dealer maintained and that it all works as it should. According to the ad, the brakes have recently been refreshed and the tires - those cat-flatteners, remember - have a decent amount of tread left on them. All that comes with an asking price of $25,000. It's getting to be that many of these early RT/10s have seen significant mods so finding one that's factory stock is not only refreshing, it's probably a better place to start if you wanted to hold onto a Viper as a long-term investment. The seller says $25,000 is his target and don't waste his time low-balling the car. What do you think, is twenty-five grand a good deal for this black beauty? Or, is that price a total pain in the asp? H/T to batphreak for suggesting this Viper, which led to today's candidate.